1) Place noodles in colander, gently pull noodles apart, run warm water over noodles and drain. 2) Heat oil to 350 degrees F.
3) Fry noodles for 2 minutes or until crispy. 4) Drain onto paper towel. 5) Noodles will keep 3 days in an airtight container. 7) Toss crispy noodles with 2 Tbsp. shredded Parmesan cheese and 1 tsp. minced fresh garlic. 8) Toss crispy noodles with 1 Tbsp. grated Parmesan cheese and ½ tsp. of granulated garlic. 9) Toss crispy noodles with 1 Tbsp. grated Parmesan cheese and ¼ tsp. cayenne pepper. 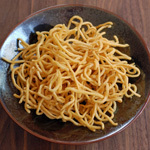 10) Toss crispy noodles with 1 tsp. Cajun seasoning.